The thump was so loud, Luis and I both raced to her room, terrified. He got there first, and still doesn’t remember how he found her — it happened so fast — but through tears, she was able to tell us that she hit her head on the floor and that she “fell up high” — probably meaning, from up high. We snuggled the hell out of her, put an icepack on her head, checked her hands, feet and back and — fearing a concussion — kept her talking. Asking her what hurt and where; if she was OK; etc. Luis has a little flashlight and we looked at her eyes. Asked her to close them, open them, blink, make “pretty eyes” — she passed each test. By 8:30 she started getting drowsy and was barely whispering her responses, so we let her sleep — then called the pediatrician. Anyway, the doctor on call said if she is talking and coherent, moving her eyes and doesn’t seem loopy, not to worry — it’s not a concussion. Music to my ears! Still, this little incident threw a wrench in my transition-to-big-girl-bed phase. The plan, til now, had been wait til we move and then put her immediately in a twin bed with her new bedding in her new room … you know, hyping it up — making the move special. Every time we go to the “big house” (as she calls it) she likes to go to “MY room,” so it only seemed natural — especially with another baby on the way, to transition her when we move in a couple weeks; there was no sense of urgency … til now. This morning, when I got out of the shower, Luis was already removing the rail from her crib which converts the crib to a toddler bed. I love my husband for a million reasons, but this is one of them: he’s quick to act, especially if my safety or Maya’s safety is at risk. Maya looked thrilled at what was happening. 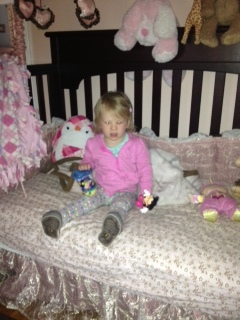 She sat down on the “new” bed and told me, with a smile on her face, “I not scared big girl bed.” You go, girl! How about you? When was the “right” time to move your kid to their big-kid bed? We moved Nate at 22 months when he climbed out of his crib. Once he climbed out once, that was it. He then climbed out EVERY time we put him in there for the two days it took for us to get his twin bed in order (he didn’t have a convertible crib). I LOVE the 24 hr answering service. We also get someone from the practice and I’ve called a few times about head bumps (oh, Nate) and they’re always like, “Did he vomit? Did he black out? Then you need to relax, he’s fine.” LOL Oddly, he never hurt himself climbing out of his crib – he was scarily adept at it but it made me SO nervous. What a great idea! I might need to hit up Target after work! You’re totally right–she’s still little and it might work. The family I nannied for used receiving blankets wrapped up into rolls under the sheet – just a little “speed bump.” They had twins and I don’t think either of them ever fell out of bed. Glad Maya is okay! Did she have anything to say about her incident?